Either you love Cheez Its or you don’t. If you’re in the camp of total fan girls, this is the recipe for you! If you’ve ever tried Cheez Its you know how salty and cheesy they are. It’s kind of addictive if you favor savory foods. Well, the thing is, a little sea salt and nutritional yeast (nutrition diva and flavor bomb) can totally mock that flavor of the real thing without going into dairy land! It’s kind of like magic. The awesome thing about this recipe – besides the fact that it requires just 8 ingredients – is that it’s quick and considerably healthy! A mix of flours give a bit more nutritional value (oat and cornmeal + unbleached all-purpose) and instead of going for all vegan butter, I mixed in some olive oil for added nutrition. The nutritional yeast and cornmeal are what give it that vibrant yellow “cheesy” color. I hope you enjoy this vegan knock-off recipe! And if you do try it, be sure to take a photo and post it to Instagram with the hashtag #minimalistbaker. I’d love to see! Enjoy! 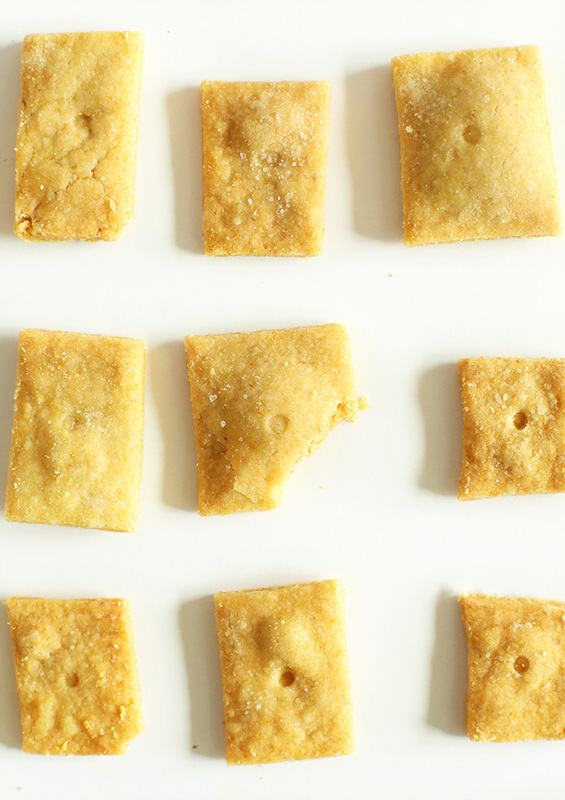 30-minute cheesy vegan crackers that taste just like Cheez Its! Simple, fast, and surprisingly close to the original. So cheezy! 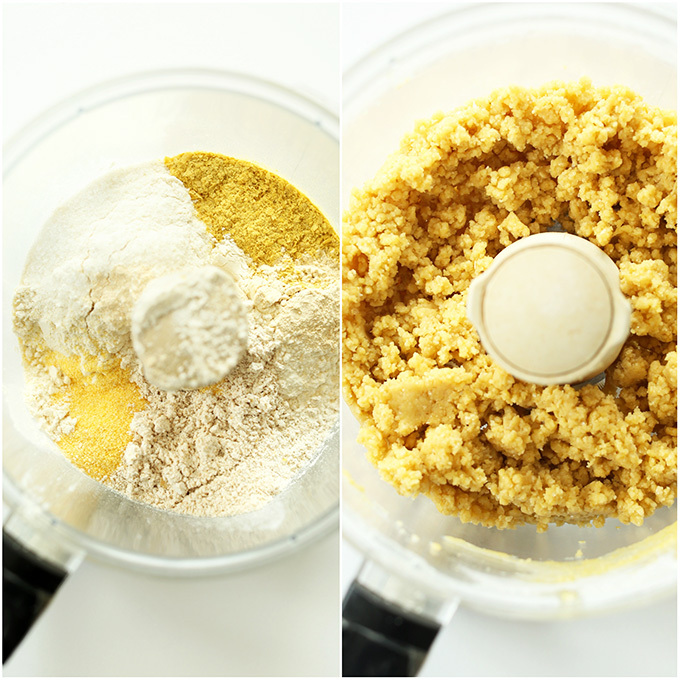 Add dry ingredients to a food processor and process to thoroughly combine. Then add olive oil and/or butter and pulse again until crumbly. Add cold water 1 Tbsp at a time until it forms a loose dough (see photo). You don’t want too much water, so go easy on it and add a little at a time. It shouldn’t need more than 3 Tbsp (as original recipe is written // adjust if altering batch size). Remove from processor and form into a loose ball with your hands. It’s actually good for this dough to be worked and warmed by the heat of your hands, so don’t worry about touching it too much. However, you are not kneading it, just forming it into a disc. Lay on a lightly floured surface – I found parchment worked great as my flat surface – dust the top with flour, and roll to 1/8th inch thick with a lightly floured rolling pin. 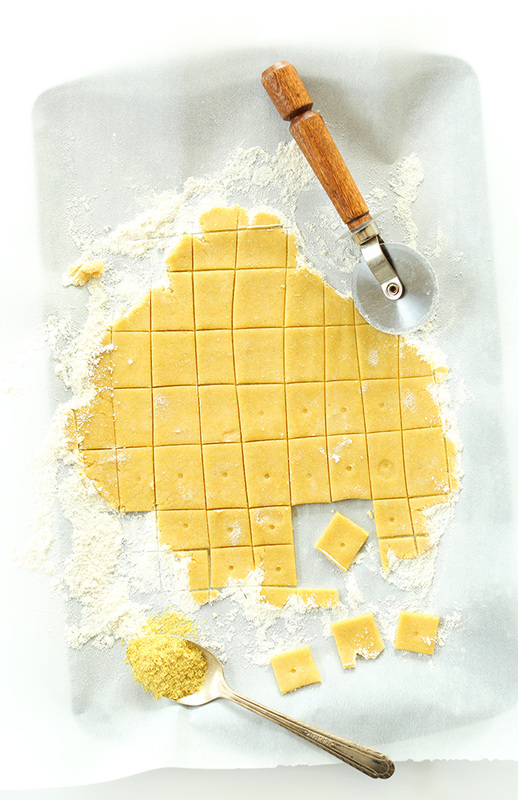 Use a knife, pizza cutter or small cut cookie cutter shape to cut the dough into square crackers. Optional: dot the centers with a fork prong or chopstick for more character/resemblance to a Cheez-It. Bake for 12-17 minutes or until puffy and golden brown. These are pretty tender. For a crispier cracker, bake until golden brown. Makes about 70 crackers (as original recipe is written). *Though I didn’t try making these gluten-free, it’s worth a shot if you’d like with my favorite gluten-free flour blend in place of the unbleached all-purpose. How can these be made oil-free? Coconut cream or plain unsweetened non-dairy yogurt! So good! Do they taste like Cheez It brand crackers? Maybe not, but that’s likely just as well as I remember those crackers being full of weird ingredients and not so tasty. I made the crackers according to the recipe and went for the higher end of the range on nutritional yeast and salt (I used Himalayan pink salt) as I like savory/salty snacks. The first time I made them, I used the median amount of salt and found the crackers a bit bland for my taste, but upping the salt the second time around suited my taste quite well. I used all-purpose flour, oat flour, the optional baking soda, and a mix of vegan butter and olive oil. I was definitely on the high end of the the range for water added to make a cohesive dough. I found the crackers to be almost overcooked at the low end of the cooking range in my toaster oven (which is usually pretty good for baking), but at the upper end of the cooking range in the conventional oven. MY daughter has a dairy allergy. Her school serves goldfish as snacks and I always have to provide an alternative for my daughters snack. I found a cheese-it cracker alternative by “Natural Balance” and they are very tasty but expensive! I can usually only find them at Whole Foods. But now I will try this recipe to save in cost! Thank You! Do I keep the dough/crackers on the parchment paper when I put it in the oven or remove them to something else? I’ve made chickpea crackers before like this and transferring them to a pan to bake was a huge mess!! Hoping to avoid that with these. Thanks! Yes, keep the crackers on parchment for baking! these taste like flour. needs a lot more nuch and seasoning. good base recipe just probably double the seasoning and add paprika. was happy to find your recipe blog when I googled making cheese crackers with vegan cheese. I am curious what you mean by them being tender? then you say to cook longer for crispier. I am wondering if the comparative Cheese-Its are to you tender so as to get an idea? I will probably take them out at the minutes mentioned and if I want them crispier, will put em back in a little longer? And also did you ever have the wonderful Hahn Carrot chips and would you consider taking on that recipe? They quit making them some years ago and there is a big fan club missing them including me ! Hi Gaea! They are tender (soft) when cooked for 12-17 minutes but for a crispier cracker, cook longer until golden brown! We haven’t had Hahn Carrot chips but I’ll be sure to add them to the recipe request list! I was so excited to find this recipe in hopes that Eli, my 3year old grandson would like them instead of prepackaged goldfish and cheez its. He does! I have made these 3 times so far and each time I add more nutritional yeast and he likes them better. However, the dough becomes tremendously difficult to roll out. I added more water with the second batch and the texture was way off. I was hurrying that time and really didn’t pay attention to how much water I was adding. With that being said, does any one have ideas about revising other ingredients to accommodate for 1/4 cup nutritional yeast? Should I just add more water in small increments or reduce the amount of one of the flours? Any suggestions would be greatly appreciated. Eli loves them and I will continue to make them but hope to reduce the amount of time it takes because the dough is so crumbly with all the nutritional yeast. Hey Terri! If you’re using 1/4 C of nutritional yeast I would say maybe leave out all of the cornmeal as well as a few tablespoons of flour and see how that works. Keeping track of how much you take out will help you in the future too in case it doesn’t turn out how you like it and you need to make changes for your next batch. Personally, I would continue to reduce the amount of flour until I got the texture I was happy with. Good luck! I’ve made these a few times now and they are great! But I do always end up adjusting the recipes I try to better suit my tastes. With this one, I found that running most of the dry ingredients through a coffee/spice grinder (even the salt) helped remove some of the gritty texture from the crackers in the end. I didn’t use a food processor and it all worked out fine. Just used a wooden spoon or my hands. I can see how some people might think it’s too salty, but I think it depends on whether you use the oil or butter. And if using the butter, probably the brand matters as well. I used all earth balance and full amount of salt and I liked them. I’m thinking this might add to the addictive quality. Perhaps I’ll dial it down a little next time. I also added a few dashes of chili powder, turmeric, and smoked paprika to the mixture, as well as extra nooch. So good! They actually had a kind of Dorito thing going on. Haven’t had those in YEARS so… YUM!!! Definitely gotta roll them thin enough. I thought I got them pretty thin and they still came out a little too chewy for my preference. But I have hope for these! Maybe a little extra baking time, too. Thank you for a great DIY cracker recipe! Thank you for sharing your changes and recipe tips, Alyssa! We’re glad you enjoyed them! Hello. Can I sub Gluten free flour for the wheat flour? Yes! We recommend using our gluten-free flour blend. I can’t believe that I just made crackers! These turned out so well, though I think that next time I’ll add more nutritional yeast–didn’t taste quite cheesy enough. Still, nice and crunchy. I used half olive oil and half vegan margarine and hand mixed the dough (I don’t like using machines when I bake) and it was SO easy, people. Took me like no time at all. I’m totally making another batch tomorrow. P.S. The dog loved them, also. Cheezits are one of my fave snack, but so Not Healthy. I just tried the recipe , and these crackers are awesomely delish, savory and salty. I think I rolled them a bit too thick, so I will make them thinner next time, and I like the idea of a little turmeric for color. Thanks for the terrific recipe! I know it’s been a long time since this recipe was originally posted, but I just saw it last night on Pinterest. I recently bought The Minimalist Baker cookbook and knew it had to be good. (So many good recipes.) I used your gf flour mix and even my husband — who thinks he can always pick out gf — thought they were good. Only complaint is that even the 3/4 tsp of salt is a bit too much. I will cut down to 1/2 tsp next time. With the gf flour you definitely have to add extra water until dough forms, but has easy enough. Excellent crackers! These taste like flat biscuits. They’re good in a weird way, but Cheez-it knockoffs, they are not. I put some strawberry jelly on mine and it was quite good. Don’t judge. Maybe it was because my oat flour wasn’t ground enough. I also used 1/4 tsp salt which was plenty with salty vegan margarine. The dough was dry with 3 tbps of water and there wasn’t enough fat, which I understand the point was for them to be healthier, but just an observation. Thanks for the recipe and nice photos. Made this yesterday and the flavour was lovely but they were extremely dry – we used olive oil instead of vegan butter but I can’t think of anything else that would have helped fix this? What do you think? Can i substitute the flour with oat flour or almond flour? We haven’t tried it, but if you do – report back on how it goes! These are wonderfully addictive! I’ve made 20? times – two times last week and I’m making a double batch ATM to share with friends. Sorry, I just kept forgetting to comment, so I’m doing it now. My hubby & I love how our house smells when they’re done! I make them GF and they turn out fantastic, though I’ve not made them with regular APF so I can’t compare. Thanks Dana for all your recipes. I actually make your granola bars, chocolate & truffles all the time too. They’re all staples in my home. My sister is sensitive to gluten so I made these using Bob’s Red Mill 1-1 GF flour in the place of the all-purpose (since that’s what I had) for which you call. They turned out really well! I did, though, have to use more water than what you specified. I didn’t keep track but it was probably about double. I can’t wait to take them to our Thanksgiving celebration tomorrow! Thank you again for another fab recipe. Hi Dana! What is the shelf life on these crackers? I’m trying to determine how much I should make in a big batch. I’m pregnant with my second child and preparing for the dreaded morning/all-day/forever sickness and I want to make these. Cheez-Its were my lifeblood last time but I’d like to upgrade to something a little healthier if possible! Hi Michelle! A few days at room temp, and 1 month in the freezer! I am making this right now for the 5th(?) time? Very good ‘Cheez-it’ cracker. My sweetie hates when we run out! I make them GF for him & they turn out great in my opinion. Thanks Dana for another superior recipe! Thanks for this recipe! I have a little girl with a ton of food allergies and was able to make these safely for her. Garlic is one of her allergies so I used onion powder instead no problem. Hi Bronte! That should work! Omg just made these but GF using almond flour instead of all purpose. So much better than cheezits. I’m going to eat the whole batch! I just made these with a friend and we both agreed they were good but WAY too salty. I will try half the salt next time because everything else was great (flavor and texture)! I couldn’t eat them because of the salt issue but she could, so I guess you have to know your preference for salty. made these! we love them! awesome recipe. THANKS!!! Just made these — yummy! Not exactly like a cheeze it, but pretty darn good. My daughter and partner couldn’t stop eating them. One issue: I added three TBSP of cold water and tried to roll it out, but it was a crumbly mess. I put it back in the food processor, added another TBSP of water, pulsed it, and it softened right up and was able to roll. So, you may need to add more than 3 TBSP of cold water. Next time I’m doubling the recipe and adding some turmeric for color. Awesome recipe, as always! Kinda taste like cardboard, maybe my nutritional yeast is old or something, I’d recommend doubling the nutritional yeast to get the cheese flavor. Do you have any recommendations for how to add a bit of tanginess to these? These were great! I used 3 tablespoons of nooch and the full teaspoon of salt bc I am a monster and they were DELICIOUS! Super easy to make too. For the oat flour I just put some oats in the food processor first, ground it, then added the rest. Excellent recipe! Could I substitute the AP flour with coconut flour? Will this affect the texture and taste radically? Hi! While we have not tried it with this recipe, take a look at this if you are going to try to substitute it. I am not sure how it will turn out, but if you give it a try, report back on how it goes! Thanks for a wonderful recipe!These were excellent crackers and were gone in 60 seconds after baking! They didn’t taste quite like cheezits, but these are delectable in their own right! I added more yeast as suggested, also added a pinch of turmeric and half a teaspoon onion powder. I reduced the salt to three-fourth of a teaspoon. Looking forward to making these again in a larger batch! I’m sorry but I’m confused as to how yeast tastes like cheese? It’s not regular yeast, it’s nutritional yeast flakes (Red Star and Bob’s Red Mill are common brands). I don’t know how the magic happens, but it does! These are very good; I have made them several times and my toddler loves them. I use the max amount of nooch. Should these be refrigerated? I usually make small batches so it was never an issue but this time I made a triple batch. I just attempted to make these with a gluten free flour, the dough turned out super dry. Anything I may be doing wrong? I had the same problem. Add more water, it worked better the second time for me. Maybe 7/8 tablespoons. I loved these. I added baking powder, added 1/4 more tsp of Nutritional Yeast, and used more all-purpose flour since I was out of oat flour. I thought these were great!! I will try them without the baking powder next time just to see the difference, but it’s definitely not necessary! Such an easy, delicious snack! I have a question- how long do these stay fresh? I want to make them in advance for a party! Thank you! A few days at room temp, and 1 month in the freezer! I just made these and I will never buy store bought vegan cheese crackers ever again! I used less salt as suggested, and added in lots of extra nutritional yeast. I also added a few shakes of onion powder and a nice teaspoon of tumeric. I cannot stop eating these. Thank you! I made these and added a little more nutritional yeast, as advised, and reduced the salt as suggested, and these tasted like baked wheat dough, completely flavorless. that was supposed to be 1/4 c + 2 T white rice flour and 1/4 c buckwheat flour, instead of the 1/2 cups. Sorry! Hi! Cheez-its are one of my all-time favorites and as an ex-pat in Europe, I have ZERO access to their glory. Tried these and they were delicious! Not ‘exactly’ like the real deal, but close enough. I made mine gluten-free, but not vegan. These were the changes that I made for anyone who can benefit from the same. 3 T. nutritional yeast – 1/4 tsp. salt – 1/2 c + 2 T white rice flour and 1/2 c buckwheat flour for the all-purpose flour, and with no access to Earth Balance (c’mon Europe!) – I opted for 1/2 butter / 1/2 olive oil. I think it took about 3 T of water to get the dough correct, but it rolled out perfectly and baked fine. I didn’t time it, just went by color. I preferred the thinner, more cooked ones, so next time I’ll roll them that way. Overall 5 / 5!! Just made this tonight and subbed in gluten-free flour.. I am obsessed! They get better the more you eat! Great recipe! What kind of Nutritional Yeast do you use and where can you buy it? What could I use if I have no cornmeal? Any sub? I have flax seed meal but am not sure that would keep the flavor as good. Great recipe! Thanks!! I make these regularly for myself & my 20 year old daughter – we are truly hooked! They are not exactly like cheez its to me but infinitely better! I made them! I’m addicted to them just like I was with the store bought Cheez its. I’m experimenting now with different batches. I add more nutritional yeast for more cheesy flavor. I used brewers yeast for my last batch instead of nutritional yeast. It’s very very cheesy… and more addicting… maybe that’s not so good because I keep eating my batches. I have to rething that. Yummmm. Tried these with whole wheat flour and they were still great! Can’t wait to make them again soon! Not Vegan, more of a low carb kinda gal, but I would consider making these for my non low carb family. Sounds delicious! I will definitely give them a go and see what they boys say. Thanks for sharing! Mine looked and behaved nothing like your recipe! I ended up with a pile of crumbs when I tried to roll it out! I gave up! To be honest… I was a bit skeptical. I googled “cookie cutters crackers vegan” and these came up. I was looking for an activity to do with the kids and I didn’t want to make cookies also my husband is vegan. The crackers were delicious. My daughter said “This is this best cracker party ever!” while eating them. Thanks Dana! I plan on trying many more of your recipes now that I found your website! These came out really cute and yummy! My guy nearly ate the whole batch as they were cooling! Thinking of adding a pinch or 2 of tumeric to enhance the color even more next time… Thanks for the great recipe! NAILED IT !!!!!! – Have just had the computer on the bench making these ’cause I needed something to have with my wine and hummus. I took one to test, just had to put a comment. Didn’t have the corn meal so used almond meal and my flour wasn’t unbleached. OMG – this is BAD!!!! This is now the fav for the evening wine. Here’s to you, Dana – you’ve done it again!!! I made these yesterday and the taste is really good! I’m amazed and so was everyone else who tried them. I would like them to be a little crisper so next time I will let them bake a little longer. Also, someone else said she used more baking powder and I might try that. We live in a humid climate so that is most likely the issue. Excellent recipe! I followed the recipe a little loosely, so my crackers were imperfect. Using all olive oil left them a little dry, so I’ll try half-and-half next time. And mine definitely need more salt! I used a grinder and was afraid of oversalting. Fortunately, I put a little more on top. Anyway, I’m lactose intolerant and very grateful for your recipe. These are really good! I used 3/4 tsp of salt, but I think I’ll reduce it even more next time. They’re a bit too salty. I also increased the baking powder to 1 tsp. I really wanted them to crisp up, and they did! I’m so excited to have Cheez-Its again! Thank you! I was craving something savoury, salty, and fast, and this fit the bill! it took me just around thirty minutes to put together, but it went fast since this was so simple to put together. My dough didn’t get that crumbly texture above, it was more like damp sand, but it stuck together so I figured it was good. The 2 tablespoons of nutritional yeast were slightly heaping, and I added the full tsp of salt. I also added a little bit of marmite (to make it more complex). They didn’t puff up, but they were very good (if a little salty). I’ll have to make some with chili next time. Thank you for the lovely recipe! Hi! I just made this recipe! The cheese its have great flavor, but are a bit dry. I had difficult time rolling them out. Any suggestions on making them moist without adding too much water? Thank you! Wow! Interesting! I recently bought nutritional yeast. I am not a vegan, but i heavily limit the amount of dairy i consume. I love food, and I love finding healthy and animal/eco friendly substitutions and products, and i just had to see what all the vegan hub-bub was about. I just made these and like i said before Wow! They are so weirdly addicting and good. These are really odd at first bite, but definitely are hitting the right spot. It’s a fun recipe. I would love to tweak it a bit for next time. Thanks for the recipe, and inspiration! wohooooooo!!! oh my these dudes are totally AWESOME! Already made them and they ARE incredible! I would give them 100 stars if i could! Thanks Dana for your amazingly GENIOUS recipes and pictures! I’m with you Stephanie, these are incredible! She’s really nailed it this time and so easy to make. Yup, I liked your comment about the 100 stars! Would this work with whole wheat flour? I bought whole wheat thinking I would be able to use it in many recipes and I really can’t. I am making them for my daughter who can’t have white flour at all. It seems like the author forgot to include the leavening agent/baking powder she refers to in her comment replies to in the actual recipe. Just wanted to let people know 1/2 tsp baking powder works great. I’ve updated that, thanks! It’s definitely optional. I didn’t add any and liked the way they turned out. I made sure to only add 3 TB water (even though I was first paranoid the crumbly texture wouldn’t form together, and wondered if adding 1 more TB would be okay). And I added less salt, but next time I’ll add the full 3/4 tsp. Oh, and I added 2 TB NY. Hmm, time consuming to roll and cut out, but worth every minute! I rolled them thin, and 12 mins was the perfect time to have crunchy crackers (not burnt!). I took a small handful at a time (I guess 1/4 cup) to be sure I rolled them out thin enough, and so I didn’t have to deal with too much. I saved half the mixture to see if I needed to add anything (now I know salt), which will be made right now. Just a wow cracker recipe. Thanks Dana! Me again! I just wanted to say I added more salt to the rest of the mixture, and now it’s just right! Simply amazing recipe. I’ve made cheez its with dairy, but they didn’t turn out as good as these! I made this for the 1st time today and they were good but dense like somebody else mentioned. Should I add some baking powder next time? Thank you! Yes! You can make them a bit thinner and add a little more baking powder next time! Mmmm! Made these for the first time today. I’ve been a vegan for little over a year and man have I missed cheezy crackers! They turned out great..thank you!! This recipe sounds great. I miss cheese its. Thanks for sharing. I made these today- SUPER EASY & TASTY! Def. will make again! Made them with 100% whole wheat flour, and they came out great! These look so delicious, I want to make them for watching football on Sundays. However, I don’t have a food processor. Do you have any suggestions on how to make them “by hand”? BTW I loooooove your food photography! You can really just make these in a mixing bowl with a whisk and/or pastry cutter. Thanks for the kind words! Food photography is such a passion of mine! This is so amazing. My family has been vegan for the past 3 years and I just discovered nutritional yeast. It has completely changed the way I cook. My kids loved this snack and it will such a pleasure to make this for them. Thank you! 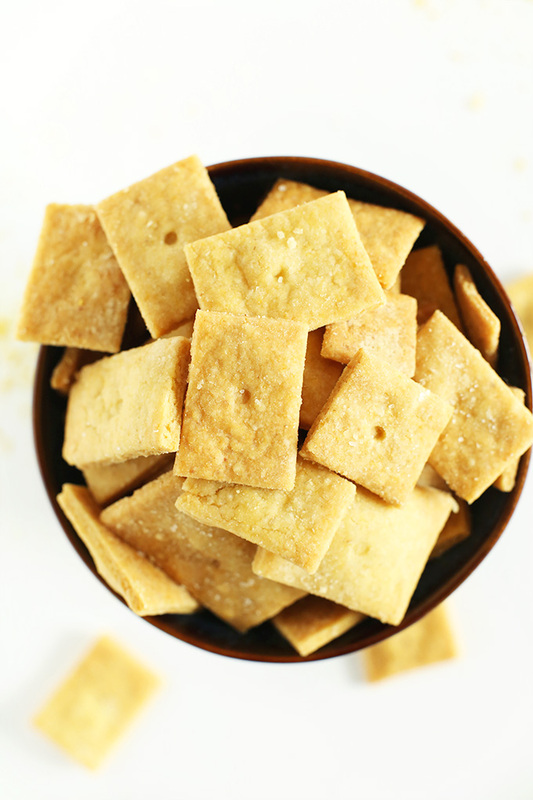 I love nutritional yeast flakes and I love this recipe for a simple, delicious cracker. 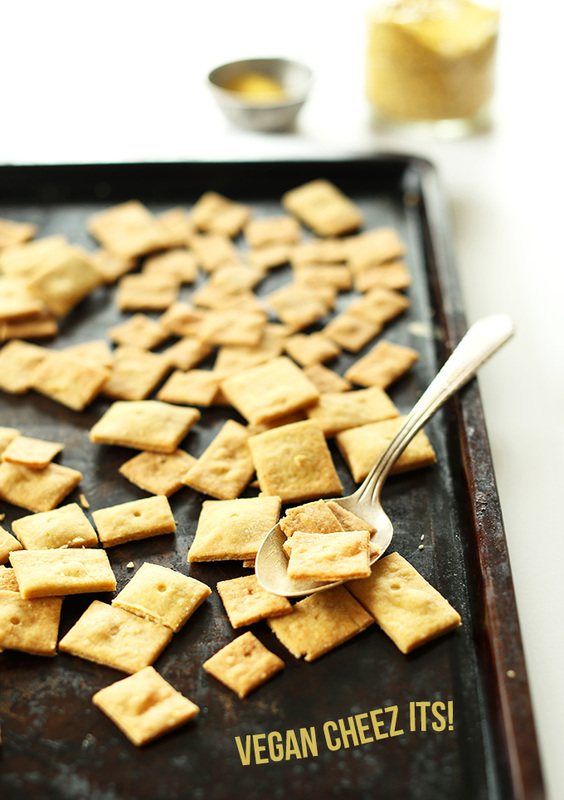 I just made these crackers and they really are a great substitute for Cheez-its. I used spelt flour and had to add a little bit more vegan butter/olive oil. I was craving that cheesy, salty flavor and these crackers really hit the spot! Tried the recipe, because I had nutritional yeast on hand and wanted to make crackers. 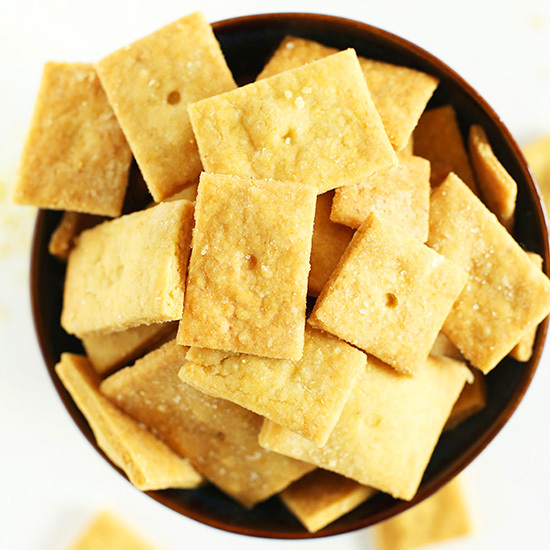 I’m not vegan or even close, but I LOVE the taste of these crackers and the fact that they are SO simple, quick, easy and can be made with only a couple of basic ingredients – flour, salt, oil, water and seasoning. It’s frugal as well :) I’m gonna try variations with various herbs next. Note: I put in the whole amount of salt… and it was SALTY. Not too salty, but very noticeably so. It depends on your taste, but I think most people would prefer the minimum amount written on the recipe. I’ve come back to this recipe a million times already whenever I need a quick salty snack. I think that they taste cheesier when you use more salt/earth balance for those that didn’t think they had enough! But even the times when they have come out not tasting like the original, I still think they are an even better replacement! So good, I don’t want the greasy dairy filled ones anymore. I made these today and LOVE them! Cheez-its is one of the things I’ve missed most. Mine aren’t puffy, though, even though I followed the recipe. I must have done something wrong — I’ll have to try again! I’m so glad these were good. I just had a veggie burger disaster for dinner and I needed something to snack on and restore my faith in my cooking. These were so yummy! I used WW pastry flour and I think next time I’ll be naughty and use AP flour, just so they are more of a treat. I’ll probably need to make these again soon…like tomorrow. Being canadian, I had never tasted cheezits until I was at a music festival in the south. After my first taste of Tabasco cheezits I was hooked and I robbed a favourite band of their stash. One year later I married the lead singer. Six years later and we’ve got 2 kids and are living in Tabasco cheezit-less Canada. Can’t wait to give these a shot!! I wanted to post for the gluten free people out there: I’ve made this recipe twice now, and the first time I used Bob’s Red Mill Gluten Free Flour blend (in place of the all purpose flour). They came out great! The second time, I made two batches, both with garbanzo and fava bean flour blend (also Bob’s Red Mill) to replace the all-purpose flour. Again, they turned out perfect, with a great crunch. Other adjustments I made: I used three heaping tablespoons of nutritional yeast to get them really cheesy (when I did this, I used a little less garbanzo/fava flour). In one batch, I added half a teaspoon of cayenne pepper to make a spicy version. This made them quite spicy, which I loved, but if you try it you might want to start with less. So happy to have vegan and gluten free cheez its! They used to be my favorite snack. Yay! So glad your substitutions worked out. Thanks for sharing, Emily!! What can I use instead of the flour to make these GF? Thank you for the recipe, can’t wait to make these!! I read your GF blend, but do you think if I just subbed almond flour instead of the blend it’d work the same?? THANKS again, your recipes are truly mouthwatering!! I made these just now! Although I’ve never had cheez-its (You can’t get them here as far as I know) so I can’t compare, these are really good! My mom found them a bit dry though so I may adjust it a little. I made these and they were fantastic and did taste surprisingly like the original. I added about 1.5 extra tablespoons of nutritional yeast and the flavor was very “cheesy” which I loved. Will be making again! Thanks! I tried this recipe tonight and it’s so tasty! Mine came out much denser then yours look though. Did you do anything to help them get a little fluffy? They are still great to munch on though! Hmm, nope! The leavening agents puffed them right up. I love making crackers and have made tons of them different ones, from black olive hemp crackers to butternut squash saffron crackers, to coconut cucumber crackers. I’ve done the cheesy ones too and used nutritional yeast for it, works great and super healthy, what a wonderful ingredient nutritional yeast is. I haven’t used All Purpose or an Oat Flours though for the crackers. The best crunchiness I achieved with brown rice flour undoubtedly, or corn flour + almond meal is a killer one too. Please make more crackers! (: Like your blog. Yay! Glad you liked them, Alexander. Thanks for sharing your modifications! Super helpful. Cheers! great ideas!! sooo happy!! thanks, Dana… for your brilliance!! it shines in my mailbox with every single recipe you create, photograph and send. deep bow. I just get mine at Natural Grocer’s! Most health food stores have it in their bulk bin. Otherwise, Bragg has one but i haven’t tried it. We just got a Natural Grocers 5 minutes from my house! I am in HEAVEN. Can I use more nutritional yeast? How much is too much? Any idea how they would work out without the oil? I know the texture probably wouldn’t be the same. We follow a WFPBNO diet, but I would like to make crackers for my family . . . Any suggestions for a suitable replacement for the oil? I made these yesterday and followed the recipe to a “T”. They are quite yummy, but I don’t think they’re cheezy enough (mine have a hint of cheezy taste, but mostly taste like I baked some flour and water!) Has anyone run into this “problem”. I did indeed use 1 T of nooch, should I try it with a bit more?! I made these yesterday and substituted a gluten free flour blend for the flour and for the oat flour. They were amazing!! Thank you! You’re the best! Thanks for sharing Wendy. SO glad you and your family enjoyed them. Cheers! Nom! These remind me a lot of Chef Chloe’s vegan “goldfish” recipe, which is delicious. I like to make them with my mini bunny cookie cutter. I will have to try your recipe, which looks equally delicious! These look so good. Nutritional yeast is such a genius idea for Cheez-its! any idea of the cholesterol in these ? Anything made without animal products has ZERO CHOLESTEROL! How cool is veganism? Your liver converts other fats and sugars into cholesterol, so there really isn’t such a thing as cholesterol-free food. However, there are foods that are less likely to produce LDL (artery-clogging bad) cholesterols. Only animal products have cholesterol. These are vegan and 100% cholesterol free! Hope this finds you with a smile! These could not be more awesome! In love! I looove to munch on anything salty + cheesy during those long hours between lunch and dinner. If I don’t havd any cornmeal, though, can I simply replace with more oat/all-purpose flour and add some tumeric for color? Thanks! Expletive expletive expletive! I love Cheez Its. I gave them up when I switched to clean eating a few years ago. So many tasty, yet empty calories. I am SO ready to try this recipe (and eat it all up). Yay! Let me know if you do, Shannon! I’m was so pumped when these appeared in my reader this morning! I’m always game for a healthy(er), savory snack. I can’t wait to whip up a batch. You are my new favorite blog. My husband and I are allergic to milk :( I keep having dreams where I’m eating Cheezits and suddenly realize I shouldn’t be! The craving will be satisfied! Ah, thanks Anne! Glad you’re finding value here. Let me know how these turn out for you! I made these today when I came home from school pulsing 1/4 cup of oats on my processor to make the oat flour and using only extra virgin olive oil. They were so good and tasted so much like the original (I guess that tells you how long it’s been since I last had the processed kind)! Thanks for the recipe! I’ve always wanted to make my own crackers. This recipe is so fun! Your post states you either like them or don’t, well im a no go but your recipe is still awesome Im more of a garlic “triscuit” and cheese on top kind of girl… Just wondering how do you decide what recipe will be featured next each time, is it just kind of what ever fits best for the time or is there some kind of formula behind your method? Just asking ? Sometimes it’s whatever pops in my mind, other times it’s seasonal recipes. So sometimes there is a method to my madness, but other times, there’s not! These looks sooooo yummy, and what a creative idea…but seriously, I love the pictures…the one of them on the tray…GORGEOUS! Ha! Thanks Hannah! Let me know if you give them a go! These Cheez Its look perfect! Everything about them. I hope you know that I absolutely wallow in all your awesome cheesy cheese-free recipes. Seriously. Please keep it up – you guys are awesome. My kids are Cheez-It ADDICTS. I can’t wait to make these for them! Pinned! I’ve made Cheeze-Its, but not vegan. I love that you went the nooch route…mmm, would love a huge bowl of these! Nooch, SO GOOD. Thanks for the share, Averie! Right? I AM addicted to nutritional yeast. So good! Let me know if you give these a try! Cheez It’s are my favorite snack as well!! Will try these for sure!! LOVE me some Cheez-its! Can’t wait to try this version. Me, the clever one? I was just looking at the V GF pizzas on your blog today and my mind was BLOWN. Like, whoa. How do you come up with this stuff?! Can we just get this over with and be besties already? Kthanks bye. Um where can I find these vegan and gluten free pizza recipes?!? Only thing I miss. Hi Stacie! Here is the recipe for our vegan, GF pizza crust! OMG – my hubby is going to love me even more when I make these for him. THANK YOU!!!!!!!!!!! Thanks Meredith! Let me know if you do! Could you substitute flax meal for corn meal? i may have a slight addiction to it..i made the regular version from Smitten Kitchen, I am soo going to give this one a try soon. Yessss, these look sooo good! I can’t wait to make these for Caleb! Let me know if you do, Maria! 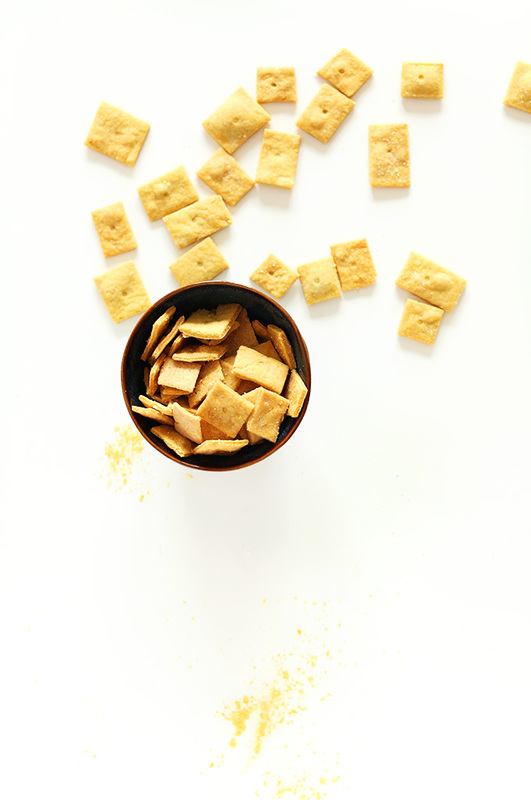 I have a few friends who are completely addicted to Cheez-Its … I can’t wait to make them a vegan version! Thanks! I have made homemade Cheese Its with real butter and cheese, but I’d love to try this healthier version. I’m sure my kids would love it! Thanks for the inspiration.